Airport Signs :- One of the fascinating things that we, as a civilization has adopted is the use of images to establish an idea. The first example of such practices might be from the Egyptians period with the use of hieroglyphics. And now today, we, as a global population have accepted certain sign and symbols to mean the same thing universally. For example, consider the sign we can denote gender, or bathrooms, or the handicap sign, and even the symbol used to denote doctors and so on. This is used to denote the entrance to the runaway from a taxi stand. This is used to denote the intersecting runaway. This denotes the area which is to be protected for aircraft approaching or departing a runway. The ILS sign is used to show that the area is to protected for ILS signals or approach Airspace. This is a well known symbol meaning no entry. Aircrafts are prohibited from entering this zone. This is used to Identifies taxiway on which the aircraft is located. And this is used to show the runway on which the aircraft is located. This sign shows exit boundary for an RSA / OFZ or rwy approach. 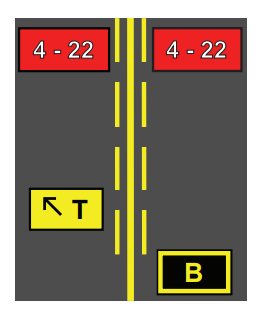 The J with an arrow sign is used to direct to intersecting taxiways. And the L with an arrow sign shows the exit taxiways from the rwy. This sign shows the direction to take off runways. And this is used to direct to airport destinations for arriving aircraft. This sort of signs shows procedural or other specialized information. If you see just a plain number, then is indicative of the remaining distance till the take-off or landing. This sign shows entrance to runway from a taxiway. And this shows entrance to area to be protected for an ILS signal or approach airspace. This sign shows location on taxiway or apron where aircraft hold short of another taxiway. This is to Delineates movement area under control of ATCT, from non-movement area. This sign shows the edge of usable full length taxiway. This sign is used to show taxiway edge where the adjoining pavement can be used. This type of airport signs are used to provide a lot of information. The sign here shows you where the entrance to the runway is in respect to the taxiway, a visual cue for the location of the hold position, the direction of the intersecting taxiways and the for identifying the taxiways on which the aircraft is located.